Join us for a unique Shabbat experience and celebrate Shabbat UK 2019 with your friends, family and community! Central Shul is participating in Shabbat UK alongside many other UK communities. We would like to use this opportunity to bring as many members of our community together for a special Shabbat experience. Many of Birmingham’s Jewish University students will be joining us and they will help to create a great atmosphere both in Shul and at the lunch afterwards. The event will take place on Shabbat, 2nd March – Shacharit service will take place at 9.30 am followed by Lunch at 12.30 pm. 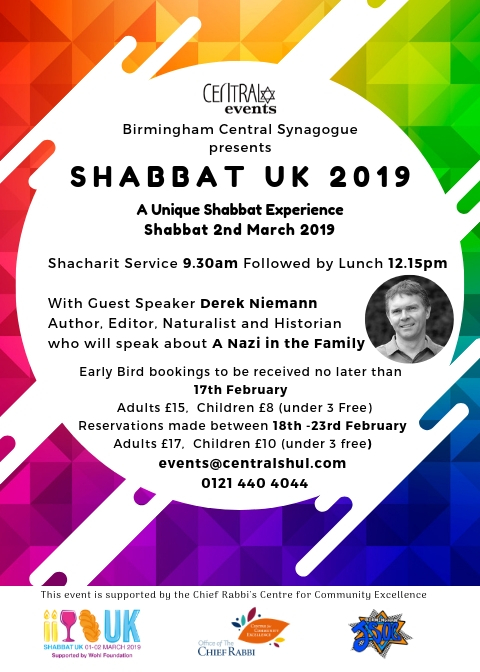 Author, Editor, Naturalist and Historian Derek Niemann will be our guest speaker and will tell his very unusual and pertinent story about having ‘A Nazi in the Family’. Whether you are a regular Shul-goer or not, we would love to have you in this special Shabbat- your presence will help to make it special.